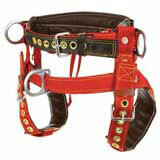 Weaver Model 1036 Sliding-Dee Wide Back Climbing Saddle. 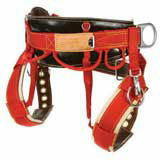 The floating dee on the front strap of this saddle provides extra maneuverability at a work station. The 6" waist back is foam filled and lined with soft brown oil tanned top grain steer hide leather to increase back support and comfort. Two sets of tool snaps and rings with four soft loops for equipment storage. 2" wide leg straps to help keep the saddle in position. Leg straps have slip on pads for extra comfort.